What Lengths Would The Vatican Go To Suppress The Origins Of Their Faith?? That's the story behind THE MESSIAH MATRIX, a thriller that delves into the secrets of the past, and brings forward those who hide them still. You will follow a young Jesuit priest and a brilliant archaeologist as they seek their passion for truth. At the same time they are trying to control their passion for each other. During their trek for truth they uncover a well kept secret. A secret that the Vatican has been keeping. A secret that the Curia has never wanted to be known. From the first page to the last you are on a quest from the ancient city of Caesarea to Rome's catacombs and beyond. It is a confirmation for those who ever wondered about the historical existence of the "Christian Saviour". This book may be the most thought provoking thriller ever written. Classical scholar and Yale Ph.D. Dr.Kenneth L John Atchity is the only author alive today capable of creating this literary and historically-based masterpiece. 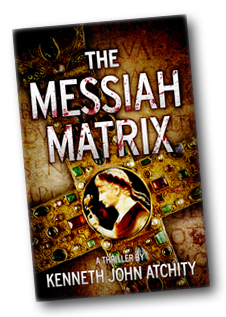 Author, Kenneth John Atchity, Ph.D., writes a brilliant novel, THE MESSIAH MATRIX. It is a story that makes the reader view religion differently. Mr. Atchity is an accomplished author, scholar and producer. There definitely isn't any disappointment in his writing. The book is definitely a page turner. It puts that gray matter to work. As the author seeks truth and origin of Christianity, the book draws the reader into corruption, murder, romance and rich history. The setting is in Italy. The author has done much research to write this story about such a controversial idea. You will find that you can't put the book down. The story of Christ is different than the story told by the Bible. The author weaves a web that at times is hard to unravel. The characters become united even when you least expect it. The book has a lot of mystery and yet a lot of usage for the brain. You get to thinking, maybe it was this way. THE MESSIAH MATRIX's subject matter is highly controversial. I believe some people will be upset with the subject matter. You have to read it with a open mind. I would recommend this book to anyone who can go into it with an open mind. Yoga Gives Back "The Rise for Women Challenge"